Ever since Niall Horan finished up the world tour for his first solo studio album, Flicker, last year, we all couldn’t help but wonder when his next batch of new songs will be coming out. We mean, Flicker was filled with bops and was easily one of our most-played albums of 2018, so it’s only natural that everyone’s dying for his next album, right? Well, the singer is already back in the studio cooking up some new tunes and naturally, we’re freaking out. That’s right, Niall first revealed he was back in the studio in November of 2018, and since then, the One Direction member has actually shared a ton of details about the new album. But when will it come out? What will it sound like? Will there be any collaborations? Don’t worry guys, we’ve got you covered. We rounded up everything we know so far about NH2 (including the possible Shawn Mendes and Liam Payne collab! ), and it seriously sounds like it’s going to be epic. Scroll through our gallery for all the details on Niall’s second studio album. Niall first confirmed that he was taking some time off to work on his second studio album on the one year anniversary of Flicker. But after he revealed that he had to undergo sinus surgery last year, fans started to worry that we might not get the album for a long time. But don’t worry, because after a few weeks of recovery, the singer revealed that he was back in the studio working harder than ever! He took to his Instagram story back in November of 2018, where he revealed that he’d been in the studio for a few days already and was super proud of himself. “Cheers to me getting off the couch and making tunes. Three days in and it’s feeling good!!!!! !” he wrote alongside an adorable selfie. He also took to Twitter to share his progress. “Very exciting watching my ideas come to life in the studio so far,” the singer wrote on November 21, 2018. And since then he’s been pretty vocal about how the process is going. On January 21, 2019, he gave fans a much needed update on the album during a Twitter Q&A. “No details as of yet apart from the fact that it’s going very well and I’m excited,” he wrote. I want to release music and have fun .. Don’t know when the music will come but I’m not coming back til I think it’s really really good . OK, so even though we don’t have an official release date yet, at least we do know that the process has officially begun and is going well! “That’s what I’ll aim for next time, not so much electric but that bit of dirt; yeah, dirt is the word,” Niall said while speaking on George Ezra’s podcast. As for his musical inspirations for the next album, he admitted he’s been listening to a lot of Elton John and Coldplay. During a Twitter Q&A, he also told fans that the album will be “fun and sad” at the same time — whatever that means! 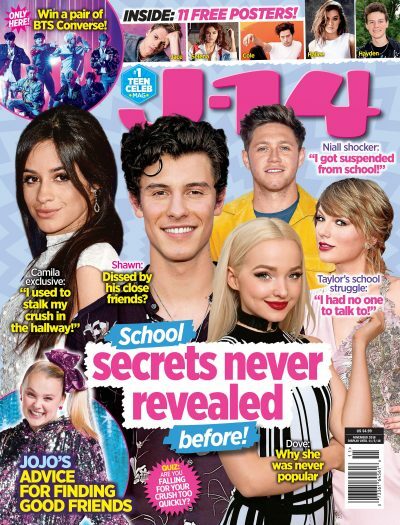 As J-14 readers know, he and his girlfriend, Hailee Steinfeld, called it quits in December, so it’s definitely possible that there will be some breakup songs on the album. Not to mention that the Pitch Perfect star has been seemingly shading Niall left and right, so we’re low-key hoping he throws in some shade of his own! Niall also admitted on George Ezra’s podcast that he’s been collaborating with some of his old favorite people on the album, as well as some new ones. As for the old favorites, he might have been referring to Julian Bunetta and John Ryan, who made an appearance on the singer’s Instagram story in November. In case you forgot, these two worked closely with One Direction on all of their albums. They also worked on Flicker with Niall, and on Harry Styles‘ solo album. As for the new ones, he might have been referring to Shawn! The two sent fans into a frenzy when they finally confirmed that they’re making a song together after months of speculation. It all started when a fan asked the 25-year-old if he and Shawn are ever going to make a song together during a recent Twitter Q&A. “We’re going to try,” Niall replied. But it was Shawn’s response that really got us. “We ARE going to!” he added. SCREAMING. “Let’s do it then,” Niall replied. And that’s not all because Niall’s former One Direction bandmate Liam even joined in on the conversation! “Can I play the triangle?” he tweeted. OK, so he might have been joking, but just the thought of Shawn, Niall and Liam on a track together is giving us goosebumps. And that’s not the only collaboration that will be on the much-anticipated LP. It’s also been rumored that the 1D cutie is collaborating with Khalid since the two had a very suspicious Twitter exchange at the beginning of the month. Khalid even RT’d a fan tweet about the speculation. Niall was also spotted in the studio with DJ and producer Diplo on January 30, 2019, so yeah, we’re sure this album is going to be epic. We seriously cannot wait for NH2.